The State Government of Punjab has recently taken a positive step to ensure the quality education to all brilliant but needy students. 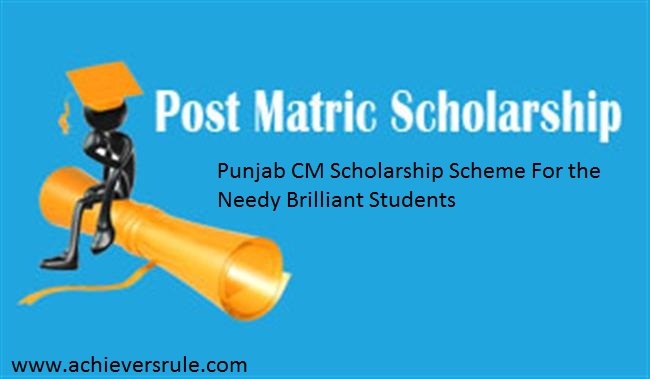 The scheme is named as 'Chief Minister Scholarship Scheme'. Under this scheme, the students would enjoy waiving of fees as per as the percentage of marks of Xth Board exam. The poor students with good marks would get effective technical education at a cheaper rate. After getting the approval from the Punjab Chief Minister Captain Amarinder Singh, this scheme was formally launched jointly by the Punjab Finance Minister Mr. Manpreet Singh Badal and Punjab Technical Education Minister Mr. Charanjit Singh Channi. The students, who are resident of Punjab, are eligible to avail the benefit of this scheme. The students who are studying in the various Government Polytechnic Colleges, Maharaja Ranjit Singh University of Bhatinda, I.K. Gujral Punjab Technical University of Jalandhar can enroll themselves under this scheme. The scheme financially must help and encourage the poor meritorious students to pursue the higher education. The aim of the Government is to provide quality education for poor through the 'Chief Minister Scholarship Scheme' at a cheaper rate. As well as, the fee waiving scheme must encourage the students to take admission in the Technical Colleges. As the fee structure of the Government and private technical colleges of Punjab are almost same, maximum seats of these colleges remain vacant. Through this scheme, the admission of these colleges must boost. There are several features of this scheme. The students of Punjab would get fee waiver scheme as per the percentage of obtained marks of 10th Board. The students who have scored 60%-70% marks would get 70% fee waiver, students with 70%-80% marks would get 80% fee waiver, students with 80%-90% marks would get 90% fee waiver. Last but not the least, the students, who have obtained more than 90% marks, would enjoy total fee waiver. Apart from that, Govt. has announced to make the rules and regulations strict to recruit the teachers of these colleges. A Doctorate degree must be needed to apply for the teaching jobs in these colleges to provide best facilities to these colleges. The Govt. will make 100% attendance of the students compulsory in the colleges. The strict action must be taken against the students having low attendance. As well as, 100% placement assistance from the Govt. will be there to ensure the bright future of the students. The infrastructure, labs of these colleges must be modified and upgraded by the Govt. The bio-metric attendance of students and teachers would be connected with the head office of Technical Education department from the ongoing academic session. The entire technical education system will be under CCTV surveillance.